We love doing DIYs on Top Billing and this week we have two awesome ideas to get your green fingers itching to garden! 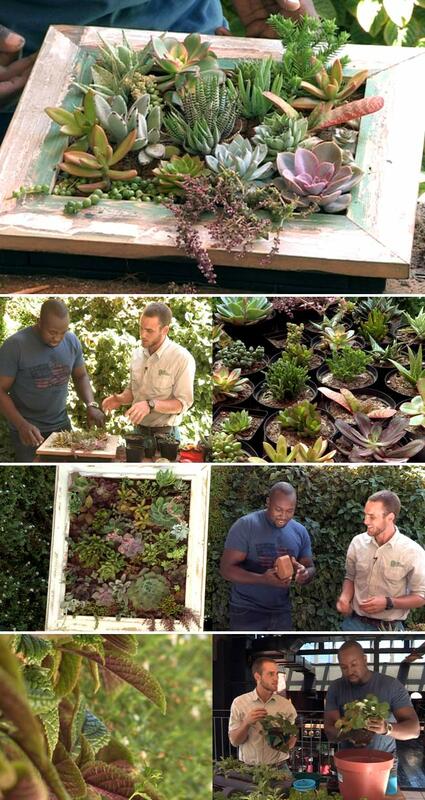 Christiaan from Cape Contours shares a step by step guide on how to build a stunning vertical garden using succulents and a rustic wooden frame and a hanging veggie garden using plastic piping! Using reclaimed wooden floorboards, skirting, or window frames, this is a great example of up-cycling. Doubling as a vertical garden and feature décor element, a succulent frame simply consists of a box frame with a mesh lining, filled with soil and planted with an assortment of beautifully coloured and textured succulents. This can then be hung on the wall in a lightly shaded spot on your patio and is sure to be the centre of conversation at your next braai. This is ideal for people living in small flats or apartments where garden space is limited. Keen cooks and foodies will love it as well. Using just a few meters of old guttering or PVC pipe, a few licks of chalkboard paint, and suspended with some rope or cabling; these hanging pipes make the perfect living herb racks for outside your kitchen door or window.